Due for an oil change? Stop by H&H Mobil. Keeping up with regular oil changes is important for the lifespan of your car. 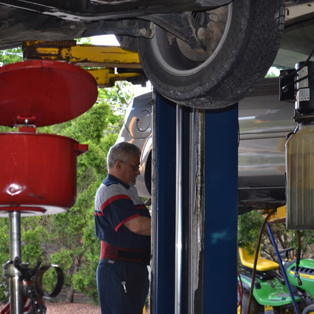 At H&H we have a team ready to assist you with a speedy oil change. Our efficient oil changes will have you in and out of the shop in 30 minutes or less while you wait. Why an oil change matters! In today’s modern vehicles, motor oil is used within the engine for more than just lubrication. Its purpose is to make sure engine wear is reduced to a minimum. As oil breaks down with time and exertion, dirt and other particles get into the engine, causing damage. Regularly changing your oil will increase performance and prolong your engines existence. Don’t put off changing your oil another day. It’s an important part of your car’s life. At each oil change, your technician will give you a sticker for your windshield with your return mileage. However, if you no longer have that as a reference there are a few other ways you can determine when you need an oil change. As a general rule of thumb you should get an oil change if you haven’t in a while before a long road trip and for frequent daily trips. Another indicator is if your car's check oil or check engine light comes on, it's a good idea to get an oil change and get your car diagnosed by a professional. At H&H Mobil, we want your vehicle to leave our shop in top condition. We use top of the line oil and lubrication products, including Mobil 1. Aside from the general oil change, we’ll make sure your vehicle is prepared for future miles by completing a 25-point vehicle inspection at every oil change. This includes checking all lights and fluid levels to ensure your car is ready for the road.